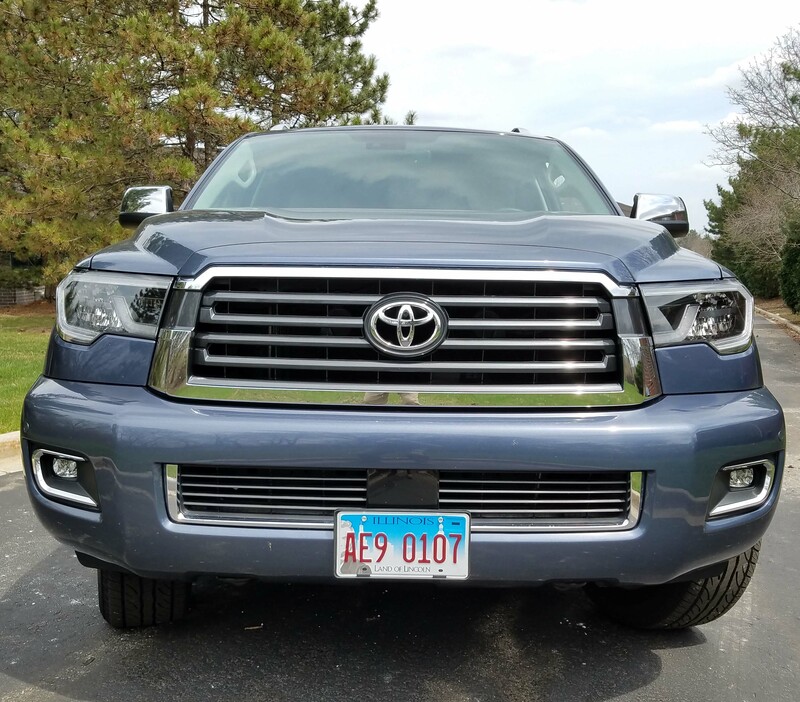 Toyota’s big Sequoia sport-ute is overdue for a restyling and needs a few interior upgrades to compete for class leader in this market dominated by the likes of Chevy and GMC’s Suburban, plus Ford’s Expedition and Nissan’s Armada. All are big boys in a big boy SUV game and Sequoia gets a new grille and front bumper to help it compete this season. But its looks are pretty vanilla. 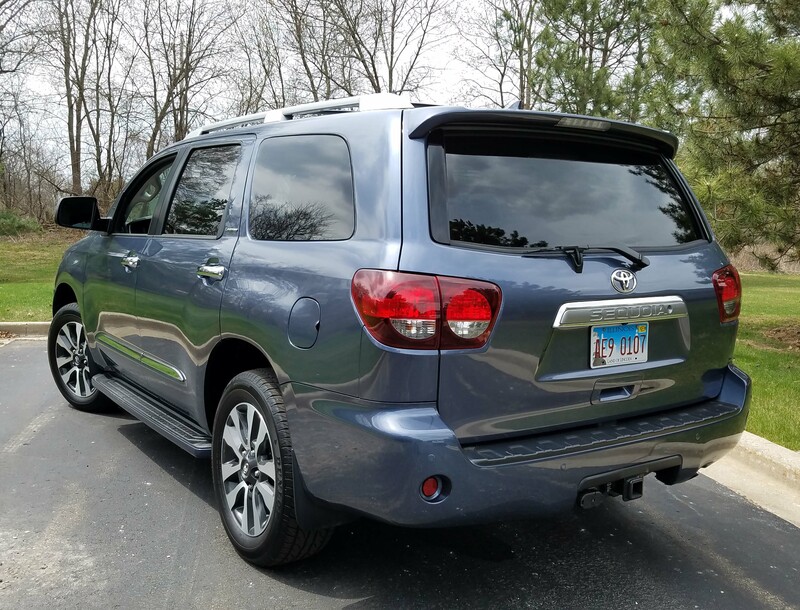 Still, Sequoia sells because it’s a Toyota with all of that brand’s requisite durability and dependability. That’s good. Plus, it performs well and comes with a full complement of safety devices. So there’s long-term value to be sure. I took my Limited test truck on a jaunt to Dayton, Ohio, and back and it performed like the champ you would expect. No issues, and good highway comfort, but mediocre gas mileage. Hey, it’s a big ute. First, Sequoia will seat eight because it includes a third row seat. This is split and will power up or down via buttons in the cargo area. Access to the rear seats is good because the second row seats slide forward to widen the way for adult hips to maneuver back there. So if you have a large family, or plan big outings with 6-8 people, the Sequoia will do the job with ease. The Limited edition also comes with a power hatch, making loading and unloading simple too. All the seats are fairly flat, with just mild hip and back support for the front seat occupants. But the seats are powered and have a power lumbar and lower cushion extender, plus an option package here added two-position memory for the driver’s seat. Another nice feature is the power tilt and telescope steering wheel. Not all big utes offer this feature standard. This one also powers up and back when the ignition is turned off, to ease exit of the truck. Power is strong, as you’d expect in a large ute. All Sequoias feature Toyota’s reliable 5.7-liter iForce V8 that creates a solid 381 horsepower and 401 ft.-lbs. of torque. With the SUV weighing in at nearly 6,000 lbs. that power is needed to haul it up to highway speeds. But it responds quickly and is well suited to its 6-speed automatic transmission. Need to tow? The Sequoia will tow 7,100 lbs. Ride is mostly fine, especially on highways. There is no sudden jolt when hitting pot holes or expansion joints, but there is the typical truck bounce over some bumps and uneven roads, especially noticed in city driving. The Platinum edition, which costs more, naturally, includes an adaptive suspension system and air suspension that likely would provide a silkier ride. Handling is fine. The ute is easy to control and maintain in its lane on highways, with not much drift and I drove this on two incredibly windy Midwest days, one on the flat windswept prairies of northern Indiana. While I felt the wind pushing the truck sideways, it was pretty easy to keep in its lane. Steering wheel effort is on the moderately heavy side, but that’s more noticed in city driving. The test truck came with four-wheel-drive, which is engaged via a dial on the dash’s center stack. It works simply and offers a couple settings. Inside, the Shoreline Blue Pearl test truck featured a black over gray interior with gray leather seats (standard in the Limited) and satin chrome trim. The steering wheel is a thick leather number. Seats are heated and there’s a power sunroof and manual shade overhead. Oddly this luxury ute had no cooled seats and the steering wheel wasn’t heated. Toyota needs to add those features to keep up with the competiton. The dash is well laid out and easy to understand, but the radio is a bit of a reach for the driver, and the screen is rather small. A truck this large should have a larger radio/nav screen to match the its size and that of the giant armrest/storage box between the front seats. It’s large enough to carry hanging files. There’s a big cubbie under the dash’s center stack and two large cup holders in the console. Those provide plenty of storage for cell phones, travel mugs, change and sunglasses. There’s also a sunglass holder overhead and one in the doors, where there are additional cup holders. Overhead with that sunroof are dual sun visors and the larger of the two will flip to the side and slide. 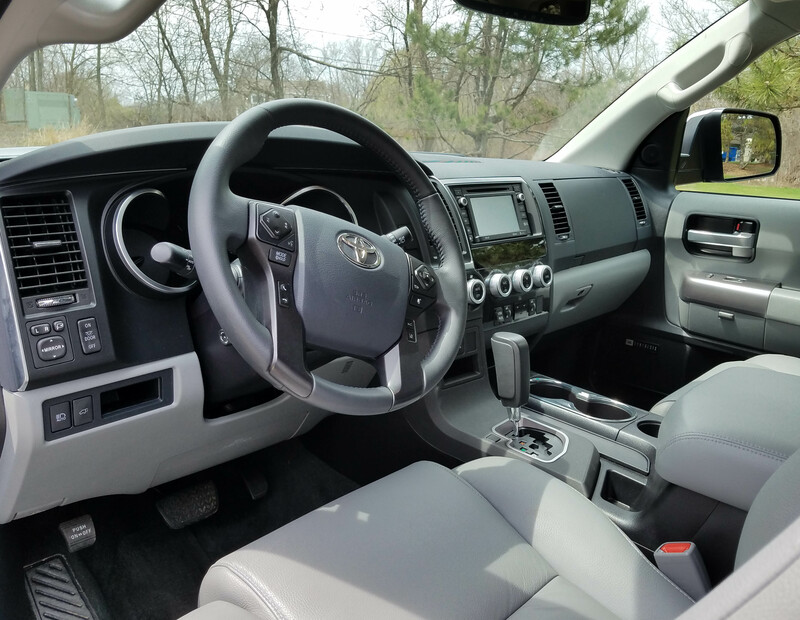 Toyota also loads the truck up with standard safety devices, including smart cruise control, a blind-spot warning system, accident pre-warning and automatic braking, lane departure alert and a rearview camera. I also like that the big truck has running boards to help us shorter drivers climb aboard and this one also had a power rear hatch window, a plus for loading ease. 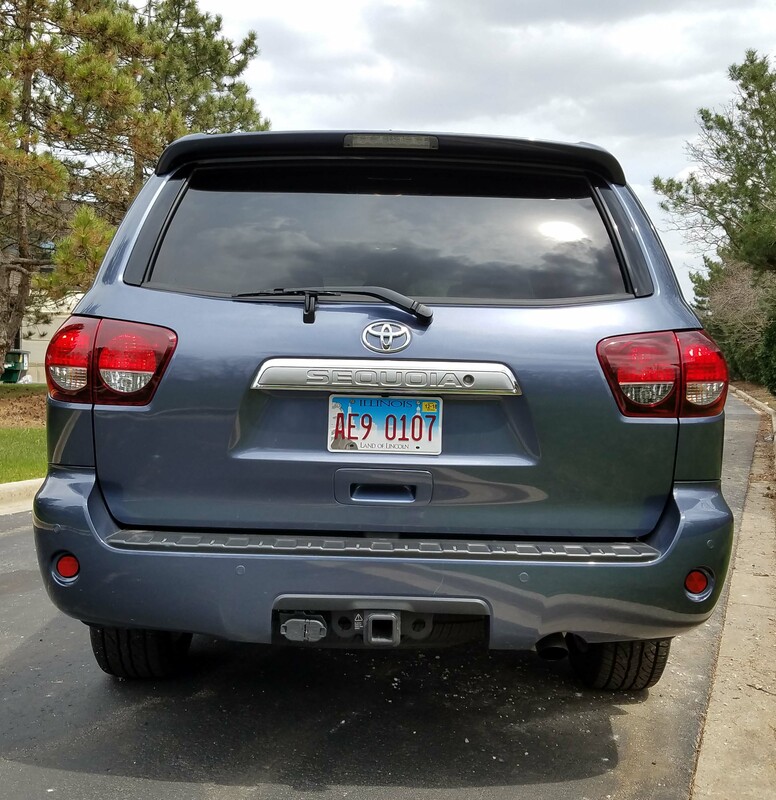 The main option package here added $1,250 to the sticker, but provided a fine premium JBL audio system including Toyota’s Entune system, plus that memory seat and outside mirror memory function. Like all large utes, gas mileage was on the short side. The EPA rates this at 13 mpg city and 17 highway, which seems about what to expect. I got 16.7 mpg over four tanks of gas, with about 90% being highway driving. When in town the trip computer showed gas mileage falling quickly. Thankfully the V8 drinks regular unleaded. Sequoia’s pricing covers a wide range. The base SR5 model with 2-wheel-drive starts at $49,695 and adding 4-wheel drive moves that to $52,920. 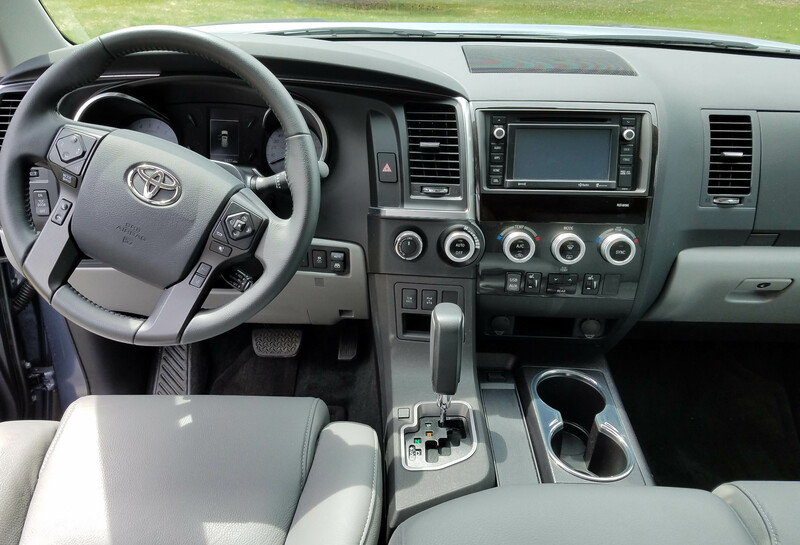 There are three other trim levels, TRD, Limited and Platinum. The tested Limited started at $61,415, including delivery, and landed at $62,900 after options. That sounds like a lot to most of us who shop in the $30,000 range, but it’s in line with other large utes. The most upscale model, the Platinum, lists at $68,630 for a 4-wheel-drive model, but does include that air suspension to help ride. 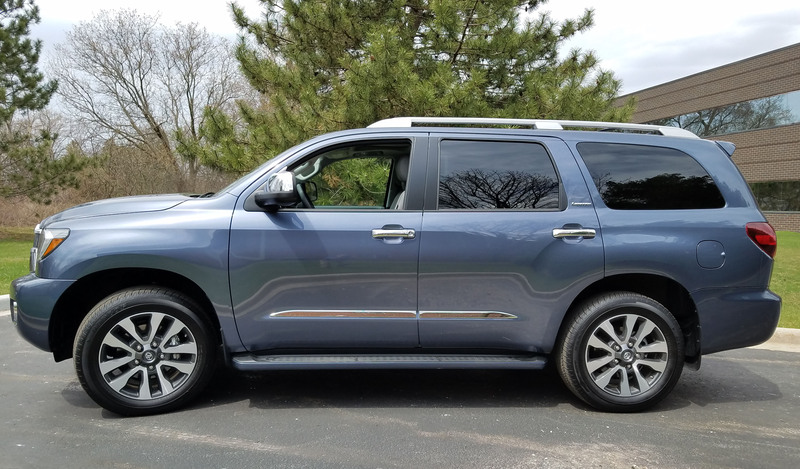 So if you must regularly move eight folks about or have a large family and plan to travel, the Sequoia is a good bet on most fronts, just don’t expect to turn any heads. Hits: Big and roomy with power fold third row seats. 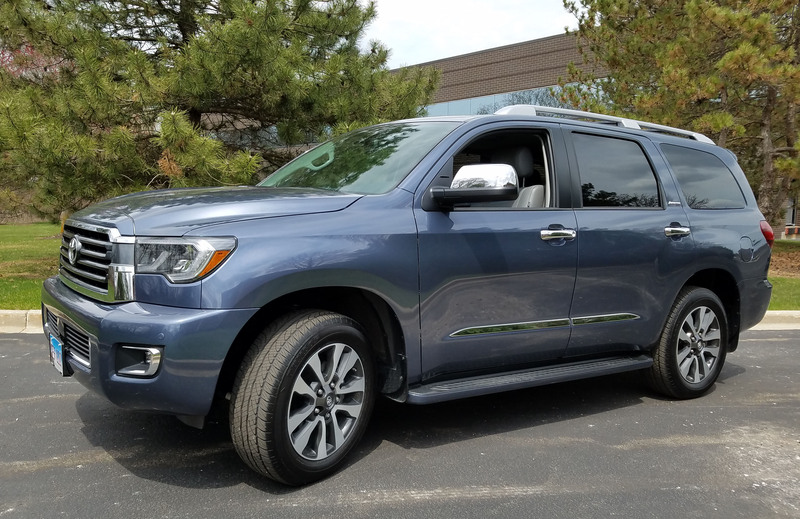 Good power, AWD and well equipped with heated seats, sunroof, power tilt/telescope steering wheel, power rear window, rearview camera, blind-spot warning, smart cruise control, lane departure warning, plus running boards, plenty of bins and cupholders and dual visors. Misses: Poor fuel economy, small radio/nav screen, no cooled seats or heated steering wheel.